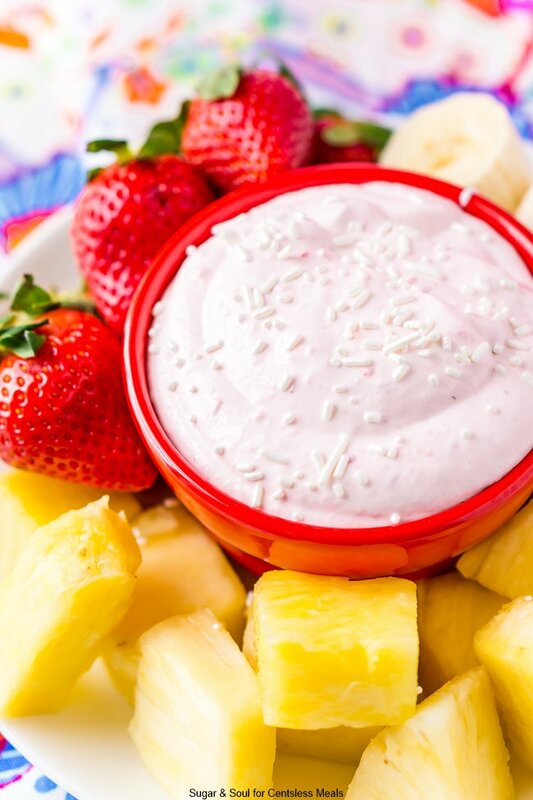 Fruit Dip is always delicious and this Strawberry Fruit Dip is no exception! It is an easy 4-ingredient dessert or snack recipe that’s perfect for Valentine’s Day and parties! Perfect to dip any kind of fruit; berries, melon, pineapple or even cookies! Valentine’s Day is coming right up and this Strawberry Fruit Dip is perfect for Valentine’s Day get-togethers and sending with the kids to school for classroom parties! I love this Strawberry Fruit Dip because it’s super easy to make. Just 4 ingredients, a little mixing and you’re good to go! 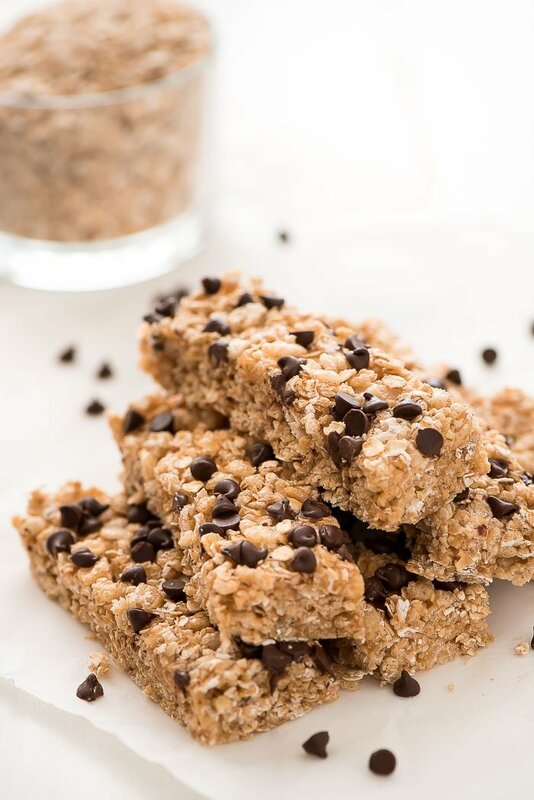 Yep, you read that right, this recipe is no-bake and so EASY! This recipe is perfect for special occasions when you don’t quite have the gumption to make my Cannoli recipe or a yummy batch of Tiramisu! And strawberries are a flavor just about everyone loves! What is Fruit Dip Made Out of? 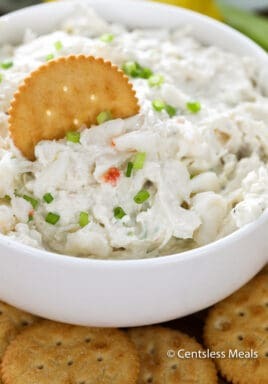 Fruit dip often contains yogurt along with a sweet element such as whipped topping or marshmallow creme. 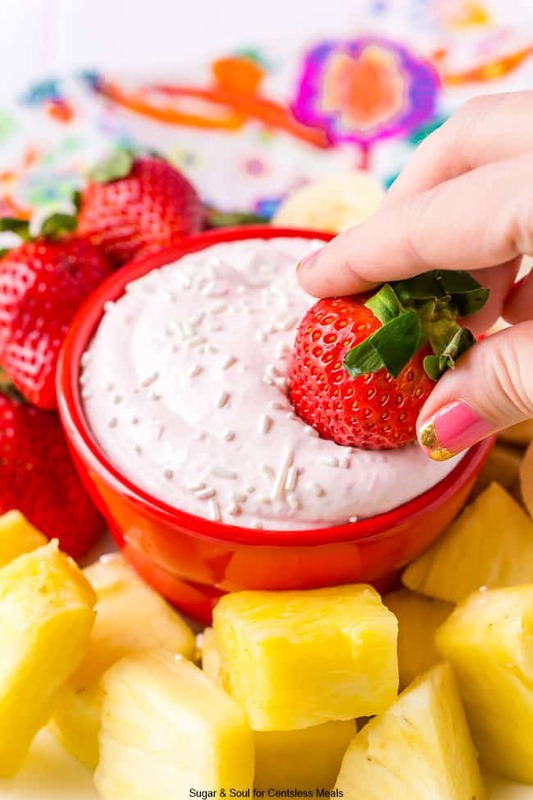 This cream cheese fruit dip is extra special because it contains fresh strawberries to add delicious fresh berry flavor (and give it a pretty pink color). The cream cheese makes it rich and delicious while the marshmallow fluff keeps it soft, fluffy and scoopable! How do you make fruit dip? As I said before, it’s really easy to make this recipe. No baking required and you’ll simply mix your ingredients together. 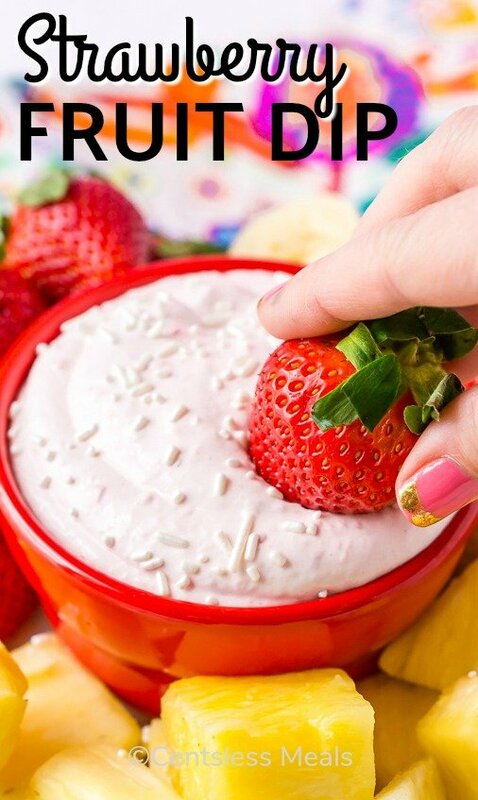 The strawberries in this cream cheese fruit dip add both flavor and color. You’re going to simply, cut the tops off and put in the food processor to puree until smooth. 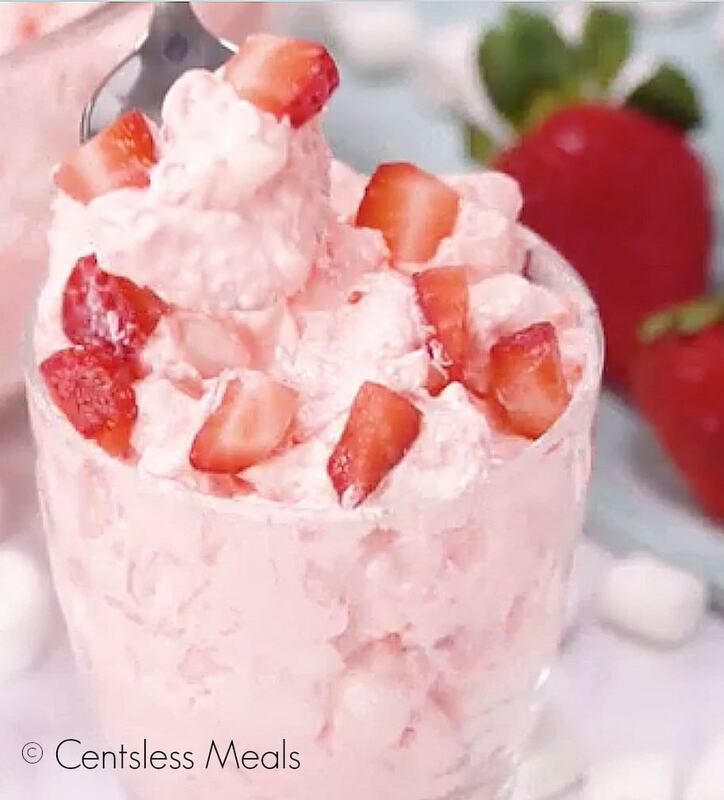 Next, you’ll add the strawberry puree to a large bowl or stand mixer along with the whipped cream cheese, marshmallow fluff, and the cool whip. Whip these together either with a whisk attachment or a hand mixer until smooth and creamy. Finally, it’s time to indulge, serve the dip with fresh fruit or store in the refrigerator in an air-tight container for up to 4 days. 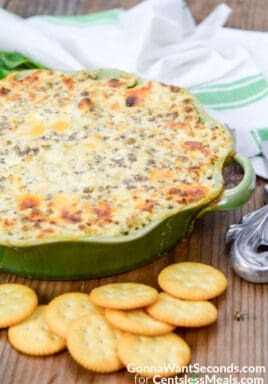 What I love most about this dip is that the flavor only gets better with time. So while it’s delicious right after making, if you store it in the fridge for a day or two, that strawberry flavor is really going to come to life. If you’re not a big strawberry fan, you can make this recipe with raspberries too. Just swap a cup of fresh raspberries in for the strawberries and puree as indicated. I love serving this Fruit Dip with fresh fruit and cubes of pound cake. I think my favorite flavor combo is fresh bananas though, so good! 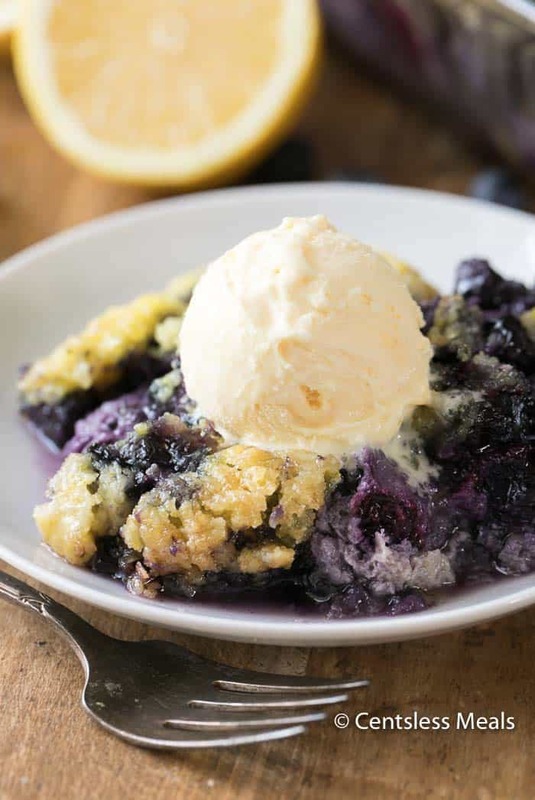 This recipe is super easy and everyone is going to love it – and you for sharing it! 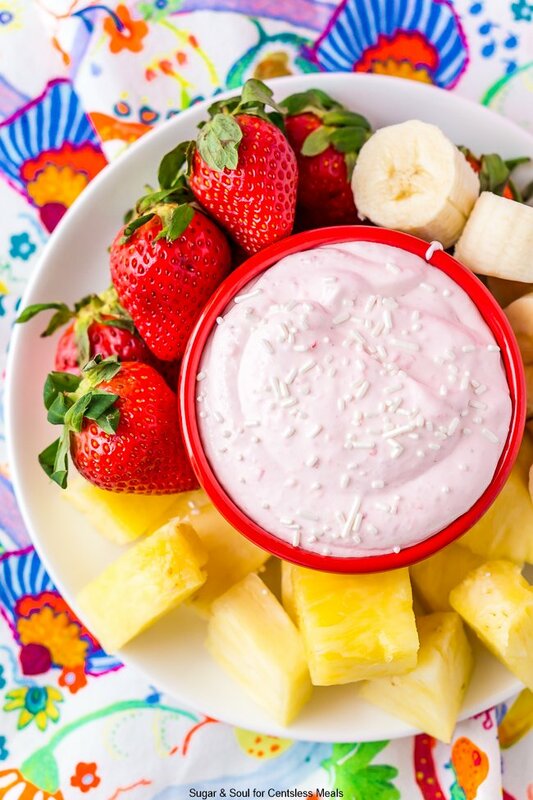 Fruit Dip is always delicious and this Strawberry Fruit Dip is no exception! It is an easy 4-ingredient dessert or snack recipe that's perfect for Valentine's Day and parties! Slice the tops off of the strawberries, add them to a food processor and puree. Add the puree to a large bowl or stand mixer with the remaining ingredients and whip until smooth and creamy with a whisk attachment or hand mixer. Serve with fresh fruit or store in the refrigerator in an air-tight container for up to 4 days. 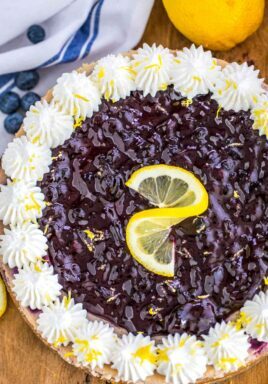 If you love this 4-ingredient no-bake recipe, I bet you’ll enjoy this Creamy Lemon Pie and this Strawberry Fluff recipe too!